Thanks so much for hosting, Java! I hope you and your family have a wonderful weekend. This is so much fun! (yes, I'm easily entertained!) Thank you for hosting! I enjoy meeting new blogger friends! Hey, happy Easter!! I haven't hooked up to your blog hop for awhile! Looking forward to finding some great new reads!! Thanks for hosting again Java! Have a great Easter Weekend. I started a new weekend hop if you'd like to come join! Guess I'm a gluten for punishment. Gonna try this thing again, and see if I can get the swing of things. Thanks for hosting. OMG Im so Happy for Celia!!!!! She is such a great person and a lovely friend!!!! And thank you for hosting!!! OH and Happy Easter to everybody!!! Hi, and thank you for hosting. I’m already following, and I've included a link to your hop on my site - there's a page devoted to hops for every day of the week. Go to the top of my sidebar for the link. Have a great Friday and wonderful Easter my friend! Thank you very much for letting us share our work. Warm regards. Leovi. Have a great easter Java! I am a new follower of your blog thru GFC. I love the colors and the flowers! I am so happy to finally find a group more my age. Almost all of the other blogs are in their 20's and new moms. I would greatly appreciate a follow back and will come back and vist more often now that I know we have our own group! Thanks for hosting again and letting me join in!!! HOPE you have a wonderful Ester weekend! 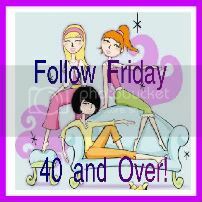 Hi Java, Thanks for hosting Follow Friday 40 and over! I'm 51 years young and just started blogging a year ago. I'm addicted and lovin every minute of it! I am a home chef, food writer and photographer. Please stop by my blog to say hello!